ATLANTA— The Center for Biological Diversity notified the U.S. Fish and Wildlife Service today of new research revealing that the alligator snapping turtle, known to grow to 200 pounds and live almost 100 years, is actually three species and therefore more endangered than previously thought. Because of threats like water pollution and overcollection for food and the pet trade, the study reaffirms, federal protection is urgently needed for the turtle, which is included in a 2012 Endangered Species Act petition filed by the Center. Photo by Garry Tucker, USFWS. Photos are available for media use. By analyzing the fossil record, modern turtle morphology and genetics, the researchers revised the taxonomy of the alligator snapping turtle to identify two new species. Turtles furthest west in their range — river drainages of the Mississippi and Mobile rivers — will remain as the alligator snapping turtle (Macrochelys temminckii). Turtles from the Suwannee River system in Florida and Georgia are now the Suwannee alligator snapping turtle (Macrochelys suwanniensis). 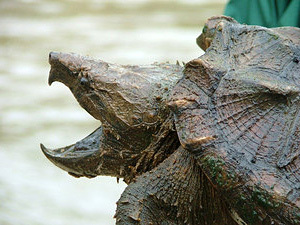 Turtles from the Apalachicola and other panhandle rivers in Florida, Georgia and Alabama are now the Apalachicola alligator snapping turtle (Macrochelys apalachicolae). The Center — along with by several renowned scientists and herpetologists including E.O. Wilson and Thomas Lovejoy, as well as Kenneth Krysko, who is one of the new study’s co-authors — petitioned for federal protection for the alligator snapping turtle and 52 other amphibians and reptiles in July 2012. Thereafter, more than 200 scientists sent a letter asking the Service to review the status of the petitioned animals. The Fish and Wildlife Service is required to make an initial finding within 90 days of receiving a petition about whether protections may be warranted — but more than a year and a half later, the agency still has not acted. With their heavily armored shells, bear-like claws and powerful beaked jaws, it’s not surprising that these prehistoric-looking turtles have no natural enemies and once thrived throughout the southeastern United States. Early in the 20th century, they were abundant in U.S. river systems draining into the Gulf of Mexico, from the waterways and lakes of the upper Midwest to the swamps and bayous of Florida, Louisiana and Texas. But recent population surveys demonstrate the turtles are now likely extirpated in Iowa, Illinois, Kentucky, Missouri and Tennessee, with declines up to 95 percent over much their historic range from overharvest and unchecked habitat degradation. These slow-moving, largely sedentary behemoths spend so much of their time sitting on river bottoms waiting for food — they use a wormlike process on their tongue to lure prey — that algae grows thick on their shells. They’re easy prey for hunters, who still look to feed thriving world markets for the exhibition and consumption of the turtles. The new study, published in Zootaxa last week, found that the back part of the turtle shell varied widely among the three now-recognized species of alligator snapping turtles. Snappers living in the Suwannee River system have a notch in the rear of their shell that is about 4 inches long, while the notches of the other two species are much smaller.